To perceive surroundings, humans can draw on five senses. But dealing with technology requires screens and speakers, which only appeal to our senses of vision and hearing. Scientists at Karlsruhe Institute of Technology (KIT) are now developing haptic displays that use the sense of touch. The VibrAID system, for example, will use vibration patterns to simplify dealing with complex control systems. "Haptic displays transmit information via the skin by vibration or pressure. This can be a smartwatch that alerts us to an incoming message through vibration or a mobile phone in our pocket that uses vibration patterns to guide us," says Erik Pescara from the Telecooperation Office (TECO) research group of KIT. But haptic feedback devices can do much more than that. TECO is developing haptic assistance systems for complex control tasks. 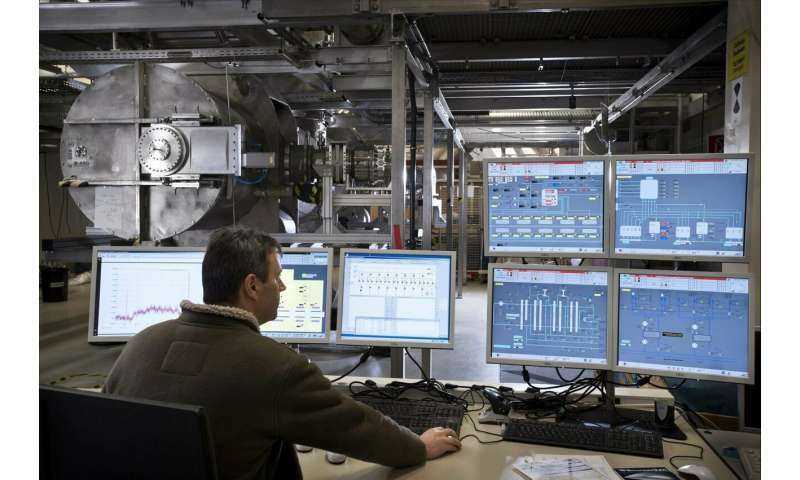 Possible areas of application of the VibrAID system include control rooms in power stations and transport networks. Large amounts of relevant data are often displayed on screens there. Although such graphical user interfaces are individually configurable, it may be that users can't find the relevant information fast enough for controlling the system in an optimum way. "We want to relieve the visual sense by drawing attention to relevant events using the sense of touch," says Vincent Diener who is developing VibrAID at KIT and also works at TECO. "A portable (wearable) system informs the user about important changes or events on the dashboard with the help of vibration patterns that the system has already learned." This means that the user does not have to be as attentive and can focus better on other tasks. "A server is running in the background, which monitors whether a threshold is exceeded in the system," says Diener. "If this is the case, the system sends the information to the user's smartphone. It will then forward the relevant data via Bluetooth to the wearable and will trigger the vibration." VibrAID consists of a wristband with ten small vibration modules. Since the electronics are easy to remove, the wristband is easy to clean. Using an energy supplier's control room as an example, the scientists are now building a realistic study environment at KIT to test the system. The haptic technologies developed by TECO show that there are smarter ways than presenting data only via monitors and speakers. In the future, haptic displays could be part of everyday life at home and at work. Proximity hat: The proximity hat uses stimulus perception through pressure. Through weak or strong signals, it transmits information to its wearer about how close walls, passageways or objects are. The system surveys the surroundings in real time via ultrasound and could help the visually impaired to find their way around a room, and firefighters around a building filled with smoke. RüttelFlug: During paragliding, it is important that the pilot receives information about the thermal conditions to be able to control the glider's ascent or descent. Usually, special measuring equipment shows the altitude and transmits the vertical speed to the pilot through visual or auditory signals. The RüttelFlug system, however, informs paragliders about a change in speed and altitude through vibrations. This means they can enjoy their flight without any annoying beeping or distracting monitors. Lots of potential here on Earth for products developed from this research. However, it would be critically important for Manned Space Flight. Human's in space face some major challenges. & one of the most immediately important is to prevent blindness among the crew. Considering how many different causes can be expected for space blindness? Preparations must include the grim expectation that prevention can never be 100% effective. An accidental release of too much oxygen? A stray high-energy radiation cascading through a microscopic gap in the gold-foil protecting your cabin? Undoubtedly other bad things I haven't visualized. ^ there you are tens of millions of KMs from any medical care or rescue.